All region dates and sites will be updated shortly. March 23-28, 2019 ~ Chilliwack, B.C. Men: The Provincial Championship will be an eight (8) team event with teams qualifying through two Provincial Qualifying Events (South and North) Triple Knockout draw to qualify teams to the Provincial Final. Women: The Provincial Championship will be an 8 team event with the teams qualifying through two (2) Qualification Bonspiels in the Province. For the Senior Women there will also be a separate Q-Spiel Fee that is to be paid to the Host Club at each and every Q-Spiel entered. This Q-Spiel fee will be set by the host committee. Rule 23(1)(g) (effective May 1, 2018) To be eligible to compete in the Canadian Senior Curling Championships, and in any Member Association event leading to the Senior national championships, each of the four players (and alternates where applicable) on every team must be: o Canadian citizens; o Residents of Canada (unless granted an exemption by a Member Association); o Members in good standing of the same Member Association; o Fifty (50) years of age or older on June 30th in the year of the Canadian Senior Championships. Therefore, players wanting to compete in the 2019 Seniors (March) as example, will be born on or before June 30th, 1969. This eligibility rule will be in effect May 1, 2018. The entry deadline for the Provincial Qualifying Events (North/South) is Wednesday, 12:00 PM noon, January 16, 2019. For Provincial Qualifying Events, the substitute may come from anywhere in the province but may not be a registered member of a team in the Senior Men’s competition. For Provincials, a substitute may come from anywhere in the province, not be a registered member of a team competing in the provincial event but could be from a registered team who has been previously eliminated from Senior Men’s competition. The Provincial Championship will be an eight (8) team event with teams qualifying through two Provincial Qualifying Events (South and North) Triple Knockout draw to qualify teams to the Provincial Final. The Provincial Final will be an eight team Round Robin Draw. The top three teams after the round robin and/or tiebreakers will advance to the playoffs. The second place team will play the third place team in the semi-final with the winner advancing to play the first place team in the Provincial Final. Two Provincial Qualifying Events (Southern and Northern) will be held on the same weekend in at dates and locations set by CURLSASK. Each qualifying event will be guaranteed two (2) berths to the Provincial Championship. The remaining berths will be allocated by the Competition Committee based on comparison of the number of entries between each event. Draw will be a triple-knockout and 8 end games. Three games per day may be a possibility. All players on the team must be members of an affiliated club in the Province. The team will also pay a separate Entry Fee for each Bonspiel, which is over and above the one-time playdown registration fee. The Entry Fee for each Bonspiel will be set by the host committee. For Qualification Bonspiels, a substitute may come from anywhere in the province but may not be a registered member of a team in the Senior Women’s competition. For Provincials, a substitute may come from anywhere in the province, not be a registered member of a team competition in the provincial event but could be from a registered team who has been eliminated from the Senior Women’s competition. The Provincial Championship will be an 8 team event with the teams qualifying through three (3) Qualification Bonspiels in the Province. Three teams from Bonspiel #1 and # 2 and two teams from Bonspiel #3 will qualify for the Provincial Championship. In the event, that a non-registered team or a previously qualified team wins a spot in one of Q-Spiel #1 or #2, that spot will be allocated to Q-Spiel #3. Therefore, the third Q-Spiel would then be used to complete the 8 teams required for Provincials and may have more than two qualifiers. At the Provincial Championship an eight team Round Robin Draw shall be used. The top three teams after the round robin and/or tiebreakers will advance to the playoffs. The second place team will play the third place team in the semi-final with the winner advancing to play the first place team in the Provincial Final. To earn a berth into the Provincial from a qualification bonspiel, the team must be registered with CURLSASK PRIOR to their commencement of play in that bonspiel. CURLSASK Registered Team requires a team to register its four players and coach, if applicable, and pay applicable CURLSASK /Curling Canada fees prior to the commencement of play. CURLSASK registered and non-registered teams can enter and play in Q-Spiel #1 and #2. Only CURLSASK registered teams can play in Q-Spiel #3. Teams that have previously qualified for the Provincials are ineligible to enter Q-Spiel #3. Q-Spiels will be a three (3) game guarantee, but not necessarily three losses. The draw shall be either a double knockout, with consolation event, true triple knockout or modified triple depending on host location and number of berths required for provincials. The draw will be completed by the host in consultation with the CURLSASK Competition Committee. The playdown levels are: Qualification Bonspiels, Provincial playdowns. At the Q-Spiels, and Provincial levels, eight end games shall be played. Three games per day may be a possibility. 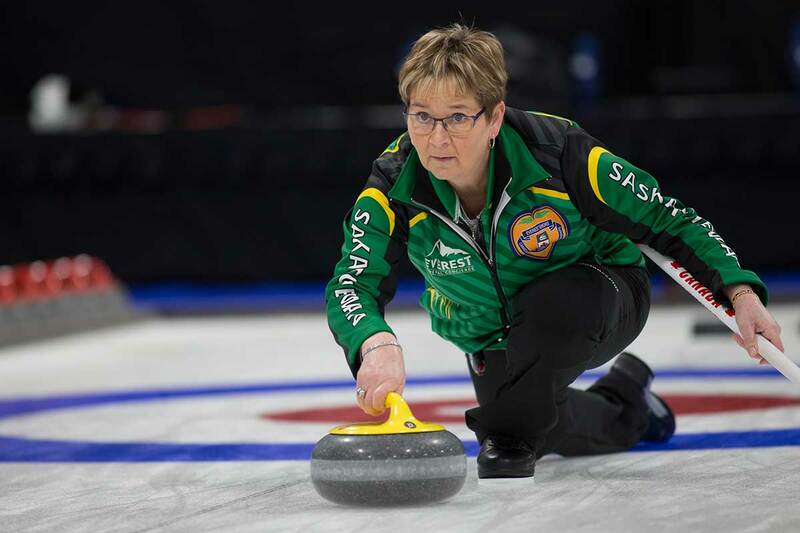 Registered team – must be affiliated with CURLSASK, have paid the $220.00, GST included Playdown Registration fee, and be registered with the CURLSASK Office. Non-Registered team – has not paid the $220.00 playdown registration fee.